Get our free weekly e-newsletter. Pesticides, by design, are toxic to plants, wildlife and people — and reducing or eliminating the most dangerous pesticides is necessary for a healthy planet. 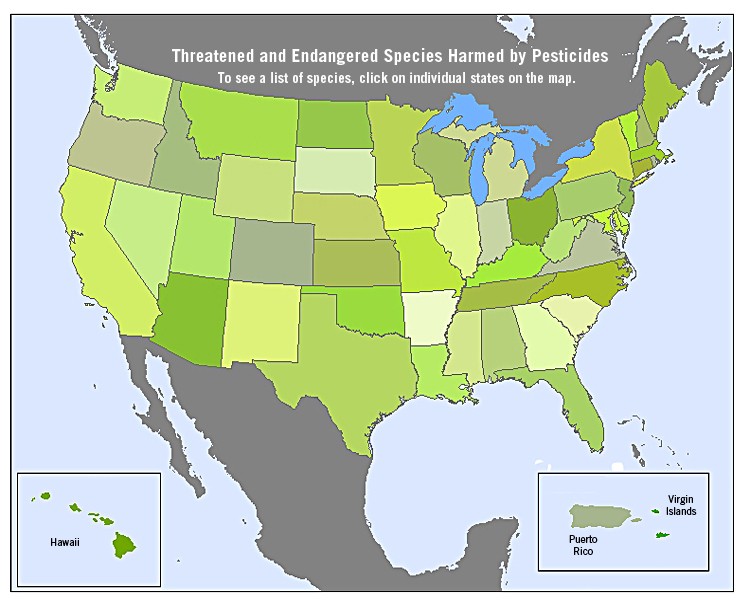 One of the best laws we have to control pesticide use in the environment is the Endangered Species Act. Endangered wildlife are the proverbial canary in the coal mine and can show the early signs of pesticide contamination in our environment. For example, before anyone knew how poisonous DDT was to humans, scientists discovered the chilling consequences the chemical had on bald eagles and other wildlife species. The Endangered Species Act requires that the government reduce the impacts of pesticides on imperiled wildlife like salmon, frogs, and salamanders that are especially sensitive to pesticides. The more we can do to protect the Endangered Species Act's tools to reduce pesticides that harm wildlife the more we do to protect human exposure to those same pesticides. In 2011 the Center for Biological Diversity and Pesticide Action Network North America filed the most comprehensive legal action ever taken to protect endangered species from harmful pesticides. The lawsuit seeks protection for 214 threatened or endangered species in 49 states and two U.S. territories. The Center continued to advance the lawsuit in 2013 to focus our legal strategy on some of the worst pesticides harming endangered species. Learn more about Our pesticides REduction campaign.